SAE International announces the release of its first suite of Aerospace Material Specifications (AMS) additive manufacturing materials and process specifications which will support the certification of aircraft and spacecraft critical parts by providing a framework to protect the integrity of material property data and provide traceability within the aerospace supply chain. “Given that advanced materials and advanced manufacturing are strategic focus areas for SAE International, we are committed to supporting the aerospace industry’s adoption of additive manufacturing technologies. Tremendous effort was expended by industry and regulatory stakeholders from North America, Europe and beyond to develop this initial suite of material and process specifications which help address the regulatory authorities’ request for guidance material for this emerging technology,” David Alexander - Director, Aerospace Standards - SAE International, said. 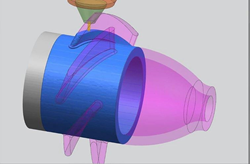 “SAE looks forward to assisting with the migration from point design to material qualification by continuing to develop additive manufacturing aerospace material and process specifications,” he added. Supported by a Federal Aviation Administration tasking letter to assist regulatory authorities in developing guidance materials for additive manufacturing (AM) certification and established in 2015, SAE International’s AMS-AM, Additive Manufacturing Committee, will continue to develop AMS specifications for metal and polymer AM to support the needs of the aerospace industry. Over 350 global participants from more than 15 countries representing aircraft, spacecraft, and engine OEMs, material suppliers, operators, equipment/system suppliers, service providers, regulatory authorities, and defense agencies are active in the committee. AM is a process that offers many benefits over conventional manufacturing methods for aircraft components due to its ability to reduce weight and production costs, manufacture at high speeds with great accuracy and decrease constraints of the existing supply chain. To learn more about SAE International aerospace standards, visit https://www.sae.org/standards.